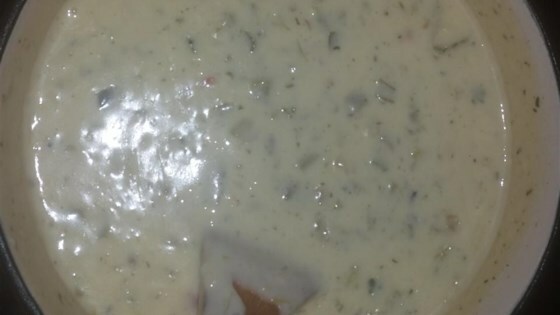 "This is a real Tex-Mex queso. It has been passed down for many years. If you are looking for restaurant-quality queso then you have found it. Serve queso dip with tortilla chips." Melt butter in a saucepan over medium heat and add onion, green bell pepper, celery, jalapeno peppers, and green onions. Cook, stirring occasionally, until soft and slightly brown, about 5 minutes. Stir in flour until combined. Reduce heat to low and add processed cheese food, pepper Jack cheese, milk, and heavy cream to the saucepan. Stir continuously until cheese is melted, about 10 minutes. If you prefer a thinner queso, omit the flour.